Mozambique was first deemed eligible for the Millennium Challenge Account for FY 2004. In fact, Mozambique was one of just three countries for which the MCA Board of Directors exercised its discretion to include among the eligible countries, despite the fact that it did not pass enough of the selection indicators to qualify. This was a sign that the Board perceived Mozambique as moving in the right direction and that the country was a good candidate to manage and benefit from the MCA process. So why, two years later, is Mozambique without an MCA compact? The country was granted $6 million in a pre-compact agreement in September – a good sign of progress; but what caused Mozambique and the MCA to get off to such a slow start? This dispatch describes several factors that slowed the process -- the bottom line is that the MCC did not seek out enough information about the country before engaging with it. As the MCC initiates engagement with a new round of eligible countries for FY 2006, it is particularly relevant to examine factors that hindered the program's progress in earlier rounds of countries. Mozambique is drowning in aid. Donors are falling over each other to get in the game, and ministries are stretched beyond capacity to manage increasing aid and the donors that provide it. Despite this, the Government of Mozambique is increasingly bold and secure in setting its own development priorities, working with donors toward greater coordination, and taking over management of an increasingly large portion of aid resources. This is the context in which the MCA came on the scene in Mozambique, and in which USG and Government of Mozambique officials, and members of the business community offered their comments about the MCA experience. While individual impressions of the MCA naturally vary, one message emerged loud and clear: The MCC simply didn't do its homework. In fact, in Mozambique the MCC failed to do its homework on the very lessons it is trying to teach: promoting innovation in the aid business; fostering country ownership; creating incentives for policy reform; and encouraging a participatory approach to national priority-setting. This dispatch takes a look at these four shortcomings of the early MCA experiences in Mozambique and tries to draw lessons for MCA engagement with newly eligible countries. The premise of the MCA is that aid can be done better; it can be administered more effectively and efficiently, and it can achieve better results. There is no doubt that the aid business can benefit from innovation, but knowing what is new and fresh requires knowing what is old and stale. The MCC came on to the scene in Mozambique without doing its homework on what had been tried in the past. In the words of one Mozambican official at USAID in Maputo, "the MCA tried to be different in a game that has been played 50 different ways." According to a Ministry of Planning and Finance official close to the MCA process, rather than working from knowledge of past successes and failures, "the MCA was built from scratch." "This," he added, "led to a great deal of delay and uncertainty." While the MCC process may eventually lead to innovation by accident, it did not have the deliberate and informed structures in place to produce innovation by intention. There are at least two sources from which the MCC could have learned about past and present experiences to better innovate for the future: from the USAID mission in Maputo; and from existing aid modalities in the country. Learning from and with USAID: Stories of early encounters between the MCC and USAID in Mozambique echo anecdotes from other countries often heard in Washington. MCC officials were dismissive, and uninterested in USAID input, and at one point outright prohibited USAID's involvement in Mozambique's proposal process. (This is consistent with former MCC CEO Paul Applegarth's insistence that countries not receive technical or financial support from USAID in the development of their proposals.) This initial sidelining of USAID left Mozambique without its potentially best ally in the proposal process -- an agency that knows both development issues in the country and the machinations of the US Government. It also deprived the MCC of on-the-ground expertise -- of knowledge of past and present aid efforts, and what has and has not worked in the country. Understanding the range of aid modalities: Mozambique is practically a laboratory for different aid approaches. Every model of aid delivery is being implemented in the country -- from project support to direct budget support; from programs that channel funds directly through the government versus those that work completely around it; and from investments in health and education to investments in private sector development and trade capacity building. In this context, creating an innovative model is tough and requires knowing about the country’s experiences with existing aid models. The MCC's early approach to working with Mozambique showed no signs of appreciating existing aid efforts, and ruffled a few feathers. In July, while the MCC was independently pursuing its model of proposal development and program design, the G-17 -- a group of donors that provides over half of Mozambique's aid resources in the form of budget support -- took the MCC to task for working so far outside of established structures and mechanisms. Through a formal letter and subsequent teleconference with the MCC in DC, these donors expressed concern over the MCC's plans to oblige the government to create new development strategies and to establish a new operational unit to oversee the use of MCA funds. They feared that the MCC’s approach was putting strains on limited government capacity, and that it threatened to undermine long-term efforts of donor coordination. This is not to say that the MCC must conform to existing aid modalities. But to ensure effectiveness, the MCC should at least be aware of, and make a nominal effort to coordinate with, other aid mechanisms in the country. Only in this way can it develop a clear approach for innovation in Mozambique's crowded aid arena. By the end of August, signs of better collaboration between MCC and USAID were emerging, and a visit by senior MCC managers to Maputo helped smooth relations with the G-17 donors. These are good indications that the MCC is starting to learn the lesson that innovation does not often occur in isolation. The MCA has argued that one of its main innovations is putting recipient countries in the driver’s seat – encouraging countries to identify their own priorities and apply for MCA funding to meet them. This is an important goal, but the MCC is not the first to think of it. Nor has it communicated a clear vision of what it means by country ownership. This section describes where the MCC approach to fostering country ownership went wrong in Mozambique, and two lessons the MCC might have learned if it had done its homework on the country before diving in. What ownership is not: "Guesswork" and "hints" were the two words most commonly used by people to describe the MCA proposal process. In an effort to have the Government of Mozambique "own" its proposal, the MCC offered the country no guidance. According to one government official, "We did not get enough hints about appropriate sectors or a ceiling on available finance." Several people commented that "it was clear the MCC had an agenda," but instead of stating it, they merely hinted at it. This kept country officials guessing until they landed on ideas that matched the MCC's priorities. According to another person involved in the proposal process, "If they had just told us straight out what they wanted, we would have saved a lot of time." Of course the MCC should not just tell a country what to prioritize, but a year-long round of the guessing game does not strike the right balance between fostering country ownership and offering guidance in the proposal process. Fifty percent of Mozambique's aid flows -- $300 million a year, are in the form of general budget support. These resources flow directly to the Ministry of Finance for allocation across sectors in line with the country’s PRSP, the new version of which is much more country-driven than its predecessor. A large portion of health sector support is pooled by donors into three common funds. The management of these funds was recently turned over to the Ministry of Health after years of being managed by the donors themselves. With regards to aid dollars for HIV/AIDS, which represent the newest tidal wave of funding in Mozambique, new donors are buying into pooled funding as a way to promote ownership. For example, at the insistence of the national government and other donors, the Global Fund for AIDS, TB and Malaria is taking an unprecedented step – it is pooling its resources with the health sector common funds. All aid resources for AIDS in Mozambique fall under the umbrella of the national strategic plan, a document hailed by government and donors alike as strong and comprehensive. In fact, the government has told donors in no uncertain terms that they must agree to work within this plan if they want to contribute to Mozambique’s fight against AIDS. While these aspects of ownership do not suit every country or every donor, they are meaningful, lasting approaches that are putting Mozambique in the driver’s seat. They create the context in which the MCC’s vision of country ownership should evolve. At the end of the day, country ownership goes far beyond the drafting of one proposal -- it entails helping develop the capacity of ministries to manage aid resources; it is about creating systems for accountability and measuring results that balance donors' needs and the country’s' priorities; it is about regular dialogue on strategies and approaches. It is, in many cases, about an active and evolving partnership between donor and recipient country. Recognizing the tradeoffs of ownership: Managing aid resources and engaging in comprehensive development planning takes work. The very real tradeoff for countries moving toward greater ownership of development strategies and resources is the strain on management that this creates. Top public sector managers that have the confidence of the donor community are often pulled in many directions. This makes it hard for them to respond quickly to new donor initiatives that demand their attention. In the case of Mozambique, the ministry official charged with managing the MCA proposal was the same person leading the revision of the PRSP. He was essentially pulled off the PRSP process that had been in motion for over a year to respond to the demands of the MCA process. While the MCC can rightfully expect top officials to be engaged in its processes, this unfortunate situation serves as a reminder that human resource constraints are real, and that in the process of fostering "ownership" with little guidance or technical support, the MCC may exacerbate constraints that all poor countries struggle with daily. There are signs that the MCC is learning that country ownership is not necessarily undermined by a little guidance and support. According to MCC’s notification to Congress on August 22, 2005, part of the $6 million pre-compact grant awarded to Mozambique is dedicated to technical support. The notification states that "In order to address the acute shortage of human and technical resources within GOM, it is anticipated that MCC will contribute to the funding of selected management consulting services to provide program development and advisory services to the MCA-Mozambique core team." This is an important and laudable step but one wonders why the MCC didn’t take it a year ago. If it had, Mozambique might already be implementing MCA-funded programs. The MCA aims to create incentives for productive policy reform in both the countries that it supports, and those that do not make the MCA cut but aspire to do so. The incentives required in each country will be different. For example, an MCA agreement of $110 million was enough to make Madagascar take the MCA process seriously, and commit to major policy reforms in the financial sector. But what would it take in Mozambique? The MCC had early aspirations of being one of the largest donors in the countries in which it operates. Mozambique heard this and responded accordingly in its early engagement with the MCC. As if to send a quiet message about what it would take to create sufficient incentives, Mozambique informally floated an initial proposal equal to its annual budget support -- $300 million per year! This $1.2 billion wish-list pieced together from the dreams of various ministries -- roads, wells, hospitals, schools, ports, bridges, training, etc. -- never really saw the light of day. But it was an early sign of what Mozambique had in mind in terms of the scale and scope necessary to create incentives for investing in the MCA process, and encourage policy reform. Mozambique and the MCC did eventually engage in a more serious round of negotiations about potential areas for support. The first real proposal, submitted in the Fall of 2004, was still a bit of a laundry list, and the MCC was right to want to narrow it. But as deliberations continued, and the potential scope of funding began to reveal itself, the government apparently decided it was not going to commit to any serious policy reform. According to one member of the business community active in the proposal process, for the government of a country drowning in aid, it just wasn’t worth it to commit to major reforms in exchange for the amount the MCC had on offer. The proposal process lumbers on. The version being finalized in July (approximately $250 million for water and sanitation, and business sector development) has yet to be made public – a sign of either ongoing disagreement with the MCC, or lack of commitment on the part of Mozambique to move the process along. This begs the question of whether the promise of the MCA may not even be enough of an incentive for Mozambique to fully throw itself into the MCA process. The lesson here is that what works for one country may not work for another. Only by doing some background homework on conditions in a given country can the MCC gather an idea of what it will take to win commitment to the MCA process and to meaningful policy reform. To its credit, the MCA has encouraged countries to take a participative approach to identifying national priorities and shaping the parameters of MCA proposals. The MCC was slow to offer guidance on this process, though, and Mozambique was left to its own devises to develop a process. 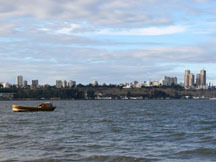 In this case, the process emerged by default more than by intentional planning, and suffered from two key weaknesses: First, the consultation was relatively narrow (dominated by the government and business groups); and second, the consultation does not seem to have effectively included stakeholders outside of the capital, Maputo. Of all the players initially engaged in the proposal process, the coalition of businesses (CTA) had the loudest, most organized and possibly the most capable voice. According to one representative of the business community, when they saw the potential boon for the private sector, and no one taking the lead on the proposal process, they "hijacked the lead." The CTA became the practical epicenter of the proposal process, with the private sector components of the proposal rising to the top. The lesson here is that in the absence of guidance or support for the participatory process, someone will show up to fill the gap. In the case of Mozambique, it was the business community, and the final proposal reflects its influence. This makes the proposal neither good nor bad -- it speaks only to the process itself. The nature of the consultative process beyond Maputo can be illustrated by the experience of several business owners in Ilha de Mocambique – an island off the north coast with enormous historical appeal and tourism potential. They were included in early consultations about the MCA proposal, meeting several times with local authorities and MCC representatives. They were invited to share their thoughts on challenges to economic growth in the region, and their ideas on how to capture the potential of the island to contribute to the development of the people living in the region. Much to their frustration, they were brought to the table multiple times for the same discussion of priorities and challenges, never to hear from the MCC or government again. Tourism fell off the proposal agenda, and no one bothered to inform folks in Ilha of this fact. The lesson here is that consultation is not consensus, and that bringing someone to the table is only the beginning, not the end of a thorough participatory process. Since Mozambique’s efforts at participatory planning, the MCC has posted guidelines for the consultative process. Under these guidelines, the FY2006 eligible countries stand a better chance of getting the process right. But the MCC should not be lulled into thinking that the guidelines will solve the tricky issues of unequal power and capacity across stakeholders, or provide an easy answer to how to provide meaningful follow-up to groups that do invest in the process, especially those whose priorities are not ultimately included. The MCC may have bitten off more than it can chew by committing itself to serious consultation in each country. It takes a lot of work and follow through, which the MCC has very little capacity to oversee. But expectations have been raised, and the MCC must find a way to meet them. Doing it well would be a measurable achievement for the MCC. Make a point to engage early with other entities familiar with the development challenges in a country. They are a valuable asset for the MCC as it tries to understanding past successes and failures, and craft an innovative approach in a given country. They can also help identify and understand stakeholders involved in the development process, and thereby help the MCC promote an effective approach to participatory planning. Map out the aid portfolio in a country. Make an effort to understand other donors’ activities, existing aid modalities, and the nature of donor/recipient country relations. This will help determine where the MCA fits and how it can best complement (and distinguish itself from) existing mechanisms. Understanding the aid arena will help the MCC know how best to foster country ownership and create incentives for a country to invest in the MCA process and commit to policy reforms. Pursue country ownership as a partnership. See it as a process that includes guidance and support on the part of the MCC. Fostering a country’s leadership in shaping its development agenda and managing its aid resources takes time. It involves the patience and willingness to invest in capacity building, and to engage in open and ongoing dialogue with a country. Focusing on this process, not just on achieving measurable results, will make a significant difference in a country’s capacity to achieve poverty reduction and economic growth. *The author wishes to recognize the substantive contribution of Jonathon Kass in the preparation of this report. 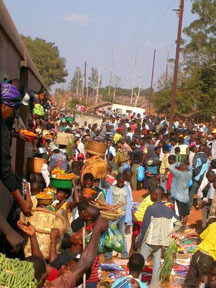 **This dispatch is based on interviews in Maputo and Ilha de Mozambique in July and August, 2005. It is intended to capture the county's early experience with the MCA, not to represent a comprehensive analysis of the MCA experience to date in Mozambique.